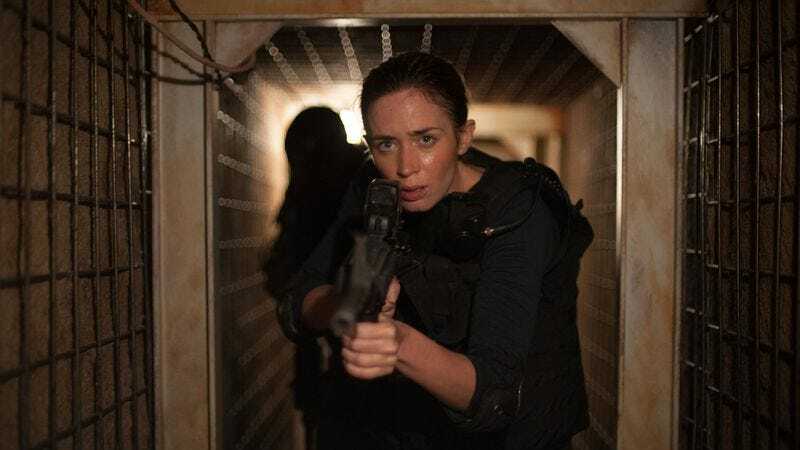 Sicario producer Black Label Media, refusing to take the lesson to get out of the drug war while you still have all your limbs, has confirmed that it’s officially moving ahead with a Sicario sequel. In an interview with The Hollywood Reporter, Black Label Media co-founder Molly Smith says that the company is “in full development with the studio” (Lionsgate) and has already received a script by writer Taylor Sheridan. We can’t reveal the plot, but you’ll see [Emily Blunt, Benicio Del Toro, and Josh Brolin] all come back. You have such a great character with Benicio, who was as dark as he was and still so loved. That character resonates so well with audiences. People want to know what happened to him, so it’s a perfect foray for us to explore. Lastly, Smith said she’d love Denis Villeneuve (Prisoners, Enemy) to return and direct the sequel, but he’s a busy guy right now, filming Story Of Your Life and prepping Blade Runner 2. She might have to find another director with a talent for building an atmosphere of such tangible dread that each new establishing shot is like gazing into the jaws of some mammoth, pitiless beast. Good luck with that.